In December 1995, due to a very rare and unfortunate accident, Jean-Dominique Bauby was thrown into a complete body paralysis. His brain stem, which acts as a conduit between the brain and the spinal chord, severed, resulting in “locked-in-syndrome”. By a stroke of ironical “luck”, Bauby retained control of his left eye and lid. Through blinks of his left-eye Bauby managed to communicate with his friends, family and caregivers. He could externalize his thoughts through painstaking blinks to form individual alphabets, words, sentences and paragraphs. And thus came about his immensely moving memoir. Almost like a tragic, poetic ending, he died after two days of the memoir’s release. Bauby was the chief editor of the popular French magazine, Elle. He led a glamorous and busy life in the romantic city of Paris. A man who was used to constant hubbub and acclaim for his work was suddenly pushed down fate’s tricky stairs. On regaining consciousness from his dangerously long coma, he had to come to terms with so many challenges and blows to his ego and dignity. But he didn’t lose much time wallowing in his angst and sorrow. He decided to keep himself busy, by not letting his thoughts rust. His mind tuned itself to be even more alert and imaginative and it flew through the world like a dazzling butterfly. He craved to interact with people and communicate his thoughts, and resented the common misconception of some of his acquaintances, that just because his body was reduced to a near “vegetative” state, he had become intellectually incompetent. 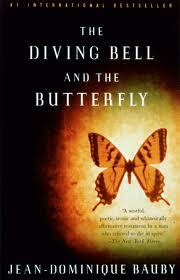 This book is one of his attempts to dispel such a thoughtless conclusion about people with physical disabilities. His memoir is a collection of his thoughts that flit from varied time periods and scenarios in his life, like a butterfly hopping from one flower to another. But he mainly focuses on his journey in his paralytic state. I honestly cannot imagine how sharp one’s mind has to be to construct exquisitely beautiful sentences and paragraphs conveying such poignant thoughts and emotions, without the luxury of a word processor, or even a piece of paper to edit and rearrange words. And while such complex processing was taking place in his mind, he had to simultaneously select each alphabet through blinks of his eye. Such perseverance and drive is incredibly inspiring. Tragedy and pain seem to bring out the best in some people. Books like these reiterate the significance of being able to express ourselves. Locked in his useless body was a brilliant mind and Bauby's sense of self, both of which came bursting forth through a tiny outlet permitted by his body. It's impossible not to be touched by this book. And it's a pity I can't read his book in French. Truly incredible ! To retain enthusiasm for life inspite of being in that state must be very hard. You have an eclectic taste in books:-) Hope you are working on writing one yourself too. Your blog is definitely among the best I've come across! I have to say I whole-heartedly disagree:-) Its possible that you might take years to piece a narrative together to your satisfaction, making sure the flow is smooth and all that, but I don't believe you need years of honing to get started! Haven't read the book. Loved the movie.